While revising much of the plumbing throughout the cabin, I figured it was a good time to add a whole house water filter. Our well water is very high quality, but like most well water, contains some sediment and sand. 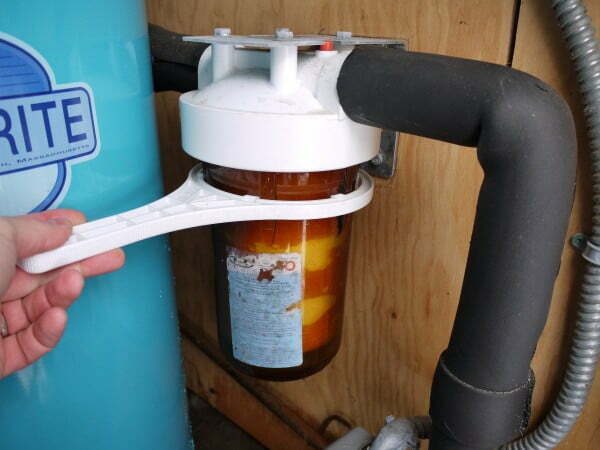 Not only will the water filter remove most of this sediment and improve the quality of the water at the tap, it will protect many of the devices in the plumbing chain, including the hot water heater, the water softener, and all the fixtures and valves in the system. Whole house water filter systems also serve as an excellent pre-filter for reverse osmosis drinking water filter systems and can extend the life of the reverse osmosis sytem. 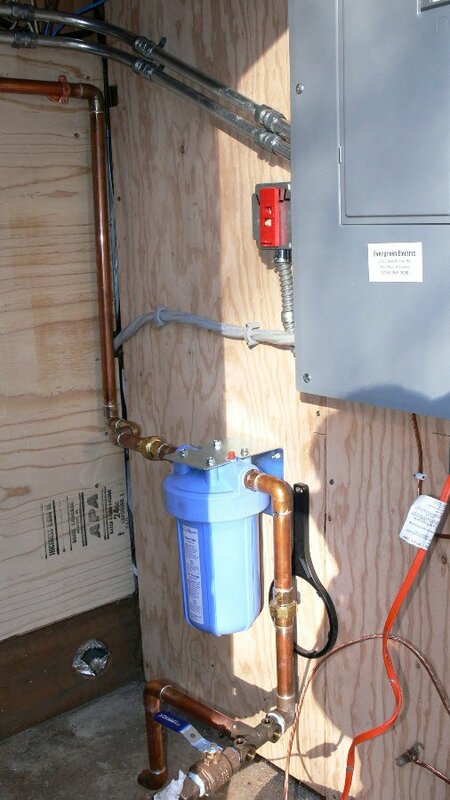 Read on to see my installation of a whole house well water sediment filter inline on our 1″ house water main in the cabin. 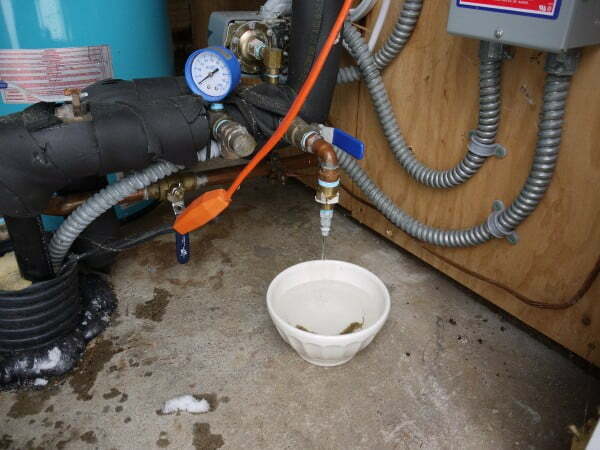 Locate cold water main of the plumbing system. Plan placement of the water filter unit on the cold water supply just after the main shut off valve. If you have city water, the cold water main is typically be the pipe with the water meter attached that emerges from the basement floor. If you have well water, this will be the supply line that comes from your well. 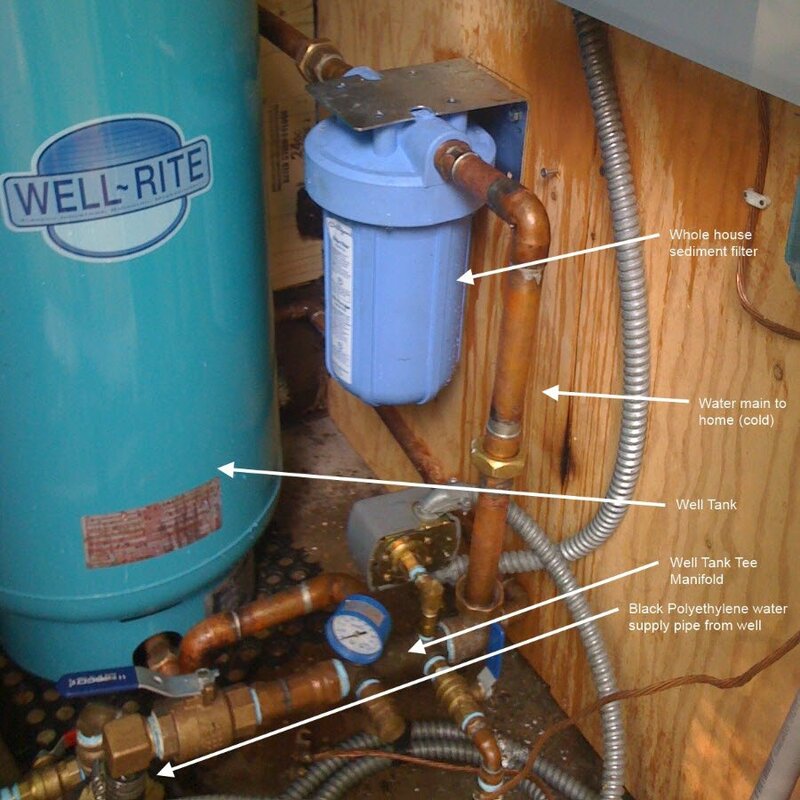 With well systems, there will often be a reservoir & pressure tank attached immediately following the well supply line. Many well systems also have a “Well Tee” manifold to allow for multiple attachments (well tank, pressure gauge, drain valve, supply line, etc) just after the well supply line. If your system has a well Tee, plan placement just down stream from fitting if possible. After locating the cold water main, find the main shut off valve and close valve. If you have a ball valve, the closed position typically indicated by a lever position perpendicular (at 90 degree angle) with the supply pipe. If your valve is a gate style valve with a handwheel, turn the handwheel completely to the right until the valve stops to close the valve. Plan placement of filter housing and mounting bracket. 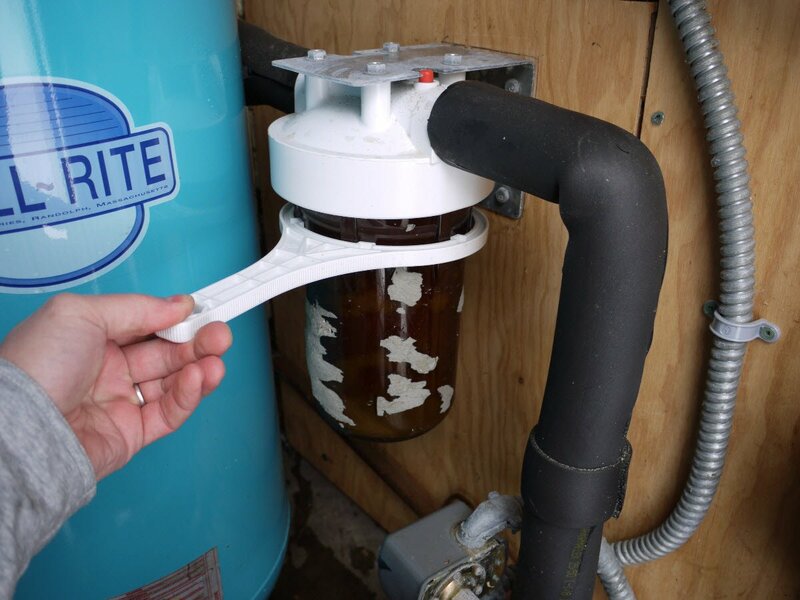 When considering the eventual location of the water filter and mounting bracket, choose a spot that allows access for filter cartridge change and provides enough space to use the provided housing wrench. Mark the water main pipe for cutting. Once you decide on a location for the filter, mark the pipe for cutting. When marking the pipe, make sure to allow space for fittings and unions you plan to add to the pipe. Most filter housings require a NPT (normal pipe thread) threaded male fitting on both the in and out side of the housing. You should also consider adding at least one union and probablly two, to allow for service of the filter body. The location of these unions is often a good place to cut into the water pipe. For this install, I used a union on both sides of the filter and cut the plumbing at these locations. 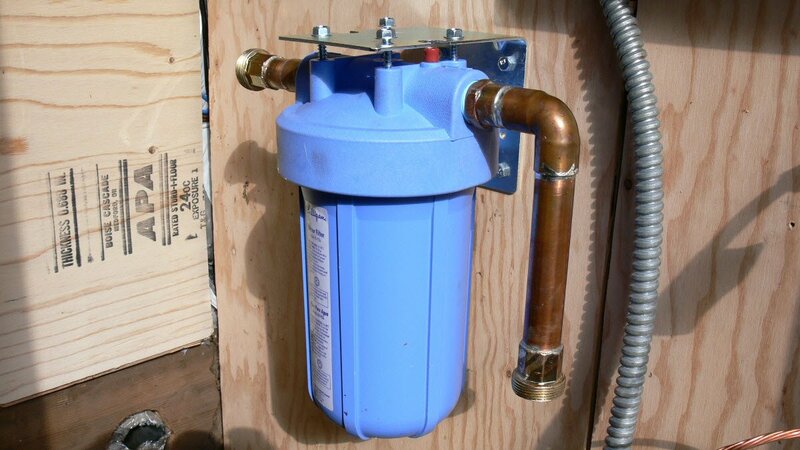 The filter I used (Culligan® HD-950A) calls for 1″ NPT attachments, so for this filter I used a 1″ copper union and a 1″ copper threaded fitting to splice the filter into the supply line. This particular filter model does not have a bypass mechanism, so if you desire a bypass circuit around the filter, you will need to plan and plumb this as well. Create the plumbing for the input and output side of the filter housing. To splice into the main circuit, I used 1″ copper unions on both the input and output side of the filter. Using unions not only allows for future service or replacement of the filter unit, but simplified the task of sweating the new copper plumbing. With unions, I could sweat (solder) the input and out copper sections individually, connect them to the filter body then install the assembled filter body with pluming attachments into the main line “en block” using the unions. 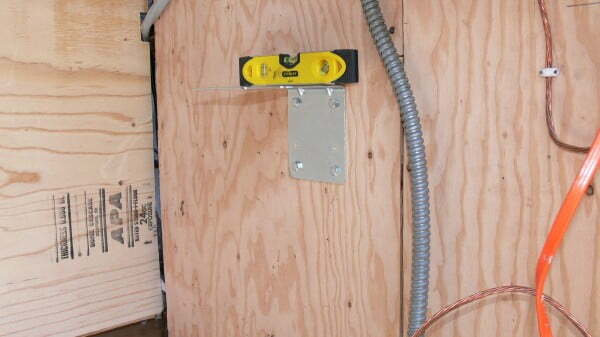 Start the splice plumbing by sweating one side of each of the unions to the cut ends of the main supply plumbing. Next, pick a location for the filter housing and install the filter mounting bracket. Then, measure, cut and dry assemble the short connection pieces needed to connect the cut input and out side of the plumbing. Each of these connection pieces will have a threaded fitting on one end and the second side of the copper union on the other . Plumbing attachments to the input and output side of the filter housing head. Mounting filter housing to mounting bracket. Attach input and output plumbing to filter body. Wrap the threaded fittings with ~ 12 inches of Teflon tape prior to attaching. Use care not to over tighten the threaded fittings in the poly filter housing as it may crack. 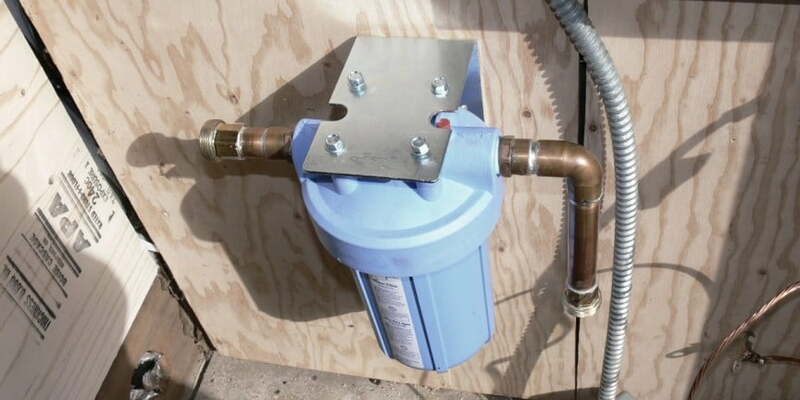 Once the plumbing attachments are installed, connect the mounting bracket (may have to be purchased separately) to the filter housing and temporarily connect to the water main plumbing. Mark the mounting bracket position on the wall where you will mount the bracket. Disconnect the filter assembly. Use the lag bolts supplied with the mounting bracket (usually not included with the filter body, and must be purchased separately). Bolt filter housing mounting bracket securely to wall. eassemble the filter assembly with the water main plumbing and tighten the coupling connections. Once the filter assembly is connected and tightened, check the position of the mounting bracket and adjust as needed. Avoid connecting filter housing to a improperly aligned bracket as this could stress plumbing connections. If you are satisfied with the bracket alignment, fasten the filter housing to the mounting bracket using supplied lag bolts or similar – do not over tighten. Plumbing connections complete, filter secured to mounting bracket. Notice filter basin wrench storage. 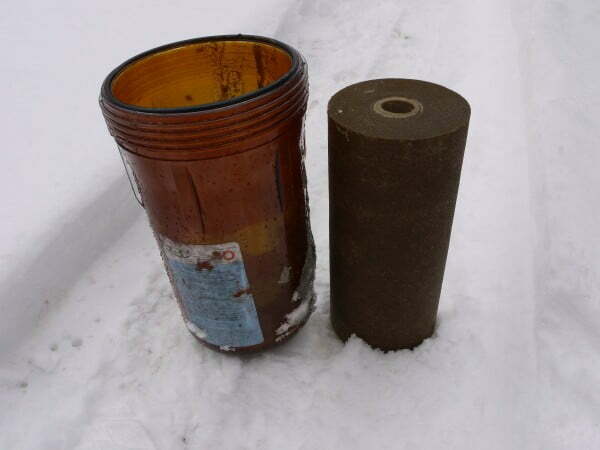 Install filter cartridge into filter housing. Water filter housing unscrewed showing filter element in housing basin. Apply silicon lubricant to the o-ring to help seal and avoid damaging the o-ring during tightening. Choose your filter cartridges based on your needs and flow requirements. Most filters list intended application (sediment, odor, cysts, etc), filter material (polyester, synthetic fiber, etc), filter size rating (in microns), max flow rates and pressure drop specs and expected filter life. Most filters should be changed every 3 – 6 months depending on use and water quality. Push air release valve at top of filter head to purge air from system. Screw filter body base into filter body head. Align threads of body with head and make sure the body is properly threading into the filter head before tightening. Once hand tight, use the supplied base wrench to tighten an additional 1/4 to 1/2 turn — do not over tighten as you can tear the o-ring seal. Once water supply is on, briefly depress red bleed valve at top of filter head to bleed any trapped air. Check for leaks and repair as necessary. Brass couplings can be difficult to seal and may need additional tightening. Flush system for 5 – 10 minutes. Enjoy your cleaner water! Remember to change your filter regularly. I use and recommend the Aqua Pure filters by 3M (Aqua Pure AP810 for this filter housing). The ideal frequency of filter element change will be determined by; your source water quality, the amount of water you use, and the type of filter you are using. Most filters should be changed each 3 – 6 months and each filter will have recommendations from the manufacture regarding filter life. To change the filter, first shut off your water supply. If possible, drain the system from a low faucet or drain valve to reduce the amount of residual water in the system that will drain when opening the filter housing. Whole house water filter element in need of replacement after six months of use. Shut off water supply and drain system. 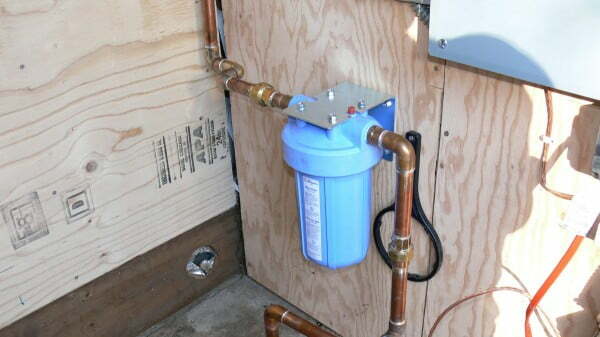 Most systems will have a shut off valve before the whole house water filter to shut off the system. 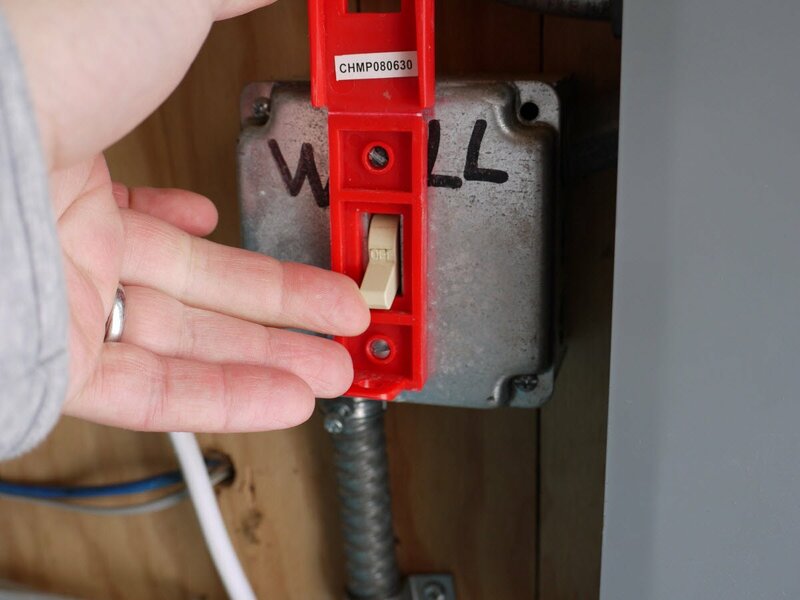 If you have a well system, turn off the well power prior to closing the shut off valve to protect the well pump from pumping against a closed system. Shut off well pump power prior to closing supply valves. Drain the system by opening a faucet or fixture located low in the system (first floor, garden hose) or use drain valve if present. Drain water system by opening valve or faucet “low” in the system. Remove (unscrew) filter basin from filter housing head. Open the filter housing by unscrewing (counter-clockwise) the filter basin from the filter head. Most filter kits provide a specialized filter wrench that will fit the filter basin. As you begin loosening the filter basin, some water will empty from the system if not totally drained – be prepared to catch it. Using filter housing wrench open basin to replace old water filter element. Remove old filter element and clean basin housing. Discard the old filter element and clean basin. Depending on your water supply, expect a significant accumulation of sediment and sand. 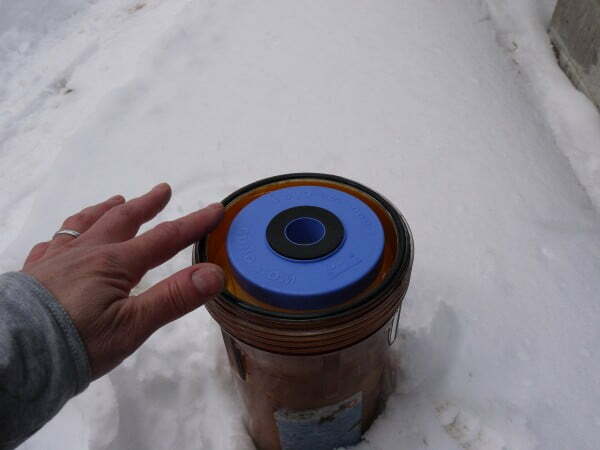 Clear plastic filter housings (like this one pictured) will discolor from minerals in the water. 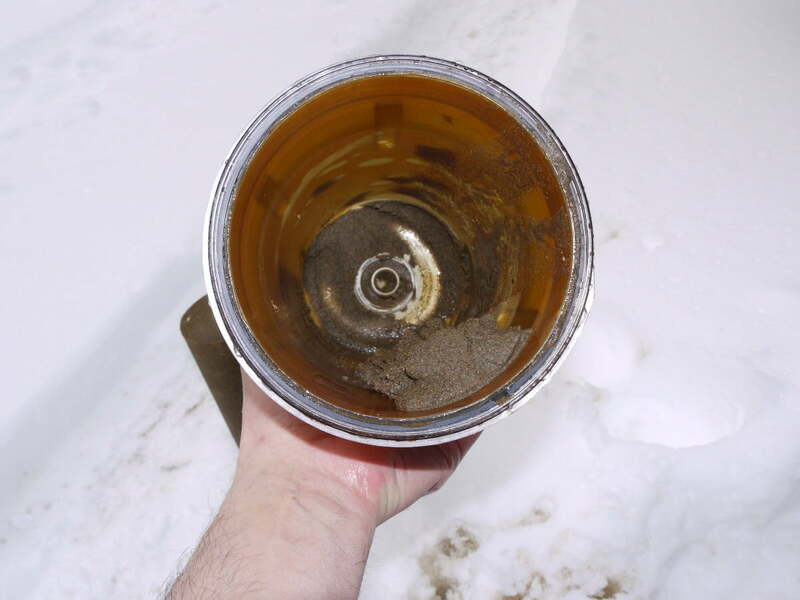 Sand at base of filter housing after six months of periodic well water use. Clean filter basin after removal of sediment and sand. Replace filter element with new filter. Place new filter element in basin and seat 0-ring. Place new filter in filter housing. Many filters have neoprene or similar seals at the ends, check to see these are in place prior to placing filter. 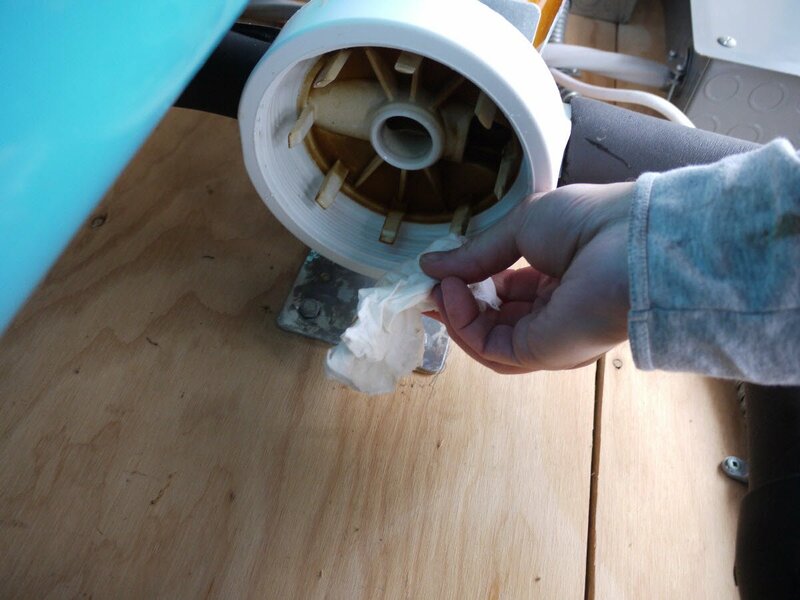 Clean the o-ring seat at the top of the filter housing with a damp paper towel to remove any grit. Clean o-ring by pulling it through damp paper toweling. Re-dress the o-ring with lubricant and place in groove. Clean, lubricate and replace o-ring prior to re-install of filter housing. Replace filter housing on filter head. Carefully line up threads on filter housing with filter body head and turn housing clock-wise to re-attach filter housing. Hand tighten, then carefully use filter housing wrench to tighten an additional 1/4 to 3/4 turn. The o-ring seal should seat and be slightly compressed to seal. Over tightening or tightening an unlubricated o-ring can tear the o-ring and prevent a water tight seal. Carefully line up threads to re-attach filter housing. Lubricate o-ring prior to re-attachment and do not over tighten or you may tear the o-ring. Open water supply, purge air and check for leaks. Once the filter basin housing is tightened, open water valve, turn on well pump power (if well pump). Purge air from the system by depressing the purge button (red on this unit) at the top of the filter housing head. Check for leaks and repair as needed. Whole house water filter install - plumbing diagram for well water system. Fittings and valves for the water filter install. Drain water system by opening valve or faucet "low" in the system. Cleaning underside of filter housing head prior to re-assembly. I will have short runs of 1″ copper pipe on either side of the filter. Is the mounting bracket necessary? I my mind, the value of the mounting bracket is in its ability to control rotational stress when changing filters. 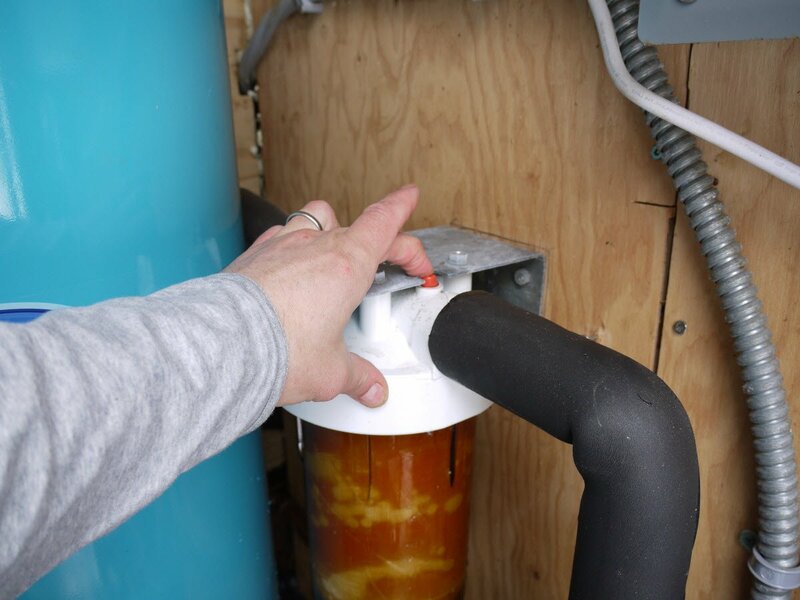 In my experience, removing the filter housing body for a filter change requires a bit of torque and could, over time, compromise the connected plumbing. Obviously each install in unique and will require some judgement regarding the importance of the mounting bracket. Did you put the filter in before or after the pressure tank? Seems to me if its after the tank, dirt will still get into the tan. The filter is after the pressure tank. You make a good point in that the pressure tank is exposed to the sediment from well. Unfortunately, there was little room before and lots of room after the tank. Maybe this reduces the life of the pressure tank some? Maybe not? Our cabin is on pilings and it does flood a couple times a year, what is the best way to filter water from the well to the cabin when there is very limited space? Currently there is no pre cabin filter it goes straight from the well to the cabin. We just bought this property and the neighbor says the water is very cloudy and we should consider a filter. I appreciate any help you can give me. Congrats on the new cabin! It sounds like you would benefit from water filtration, and maybe more than just sediment filtration. At our cabin, we have mainly an issue with sand and other sediments. To filter these we use the whole house system described above. In addition to the whole house sediment filter, we use a small under-counter in-cabinet reverse osmosis system for our drinking water. This system is small enough to mount in the cabinet under a sink. The best system for your situation depends on your specific issues. If access to your water main from the well is difficult, and your are looking just for better drinking water, you could simply add one or more reverse osmosis units at the point of use (like the under sink units). Most of the these systems have a small reservoir tank that stores several gallons of filtered water. This type of system would only be useful for drinking or cooking water, as the water is not filtered in “real-time” in line, but slowly and stored in the reservoir. If you wanted to add some limited easy to add sediment filtering in addition to the reverse osmosis unit, there are single fixture in-line sediment filters that could be used for individual applications (like at the shower head). For your system, I would add an under the counter reverse osmosis system for drinking and cooking water to begin with. These systems are compact enough to fit most residential systems (see attached image courtesy of Omnipure) and fairly simple to install. We use a version that I purchased from our local Costco store. 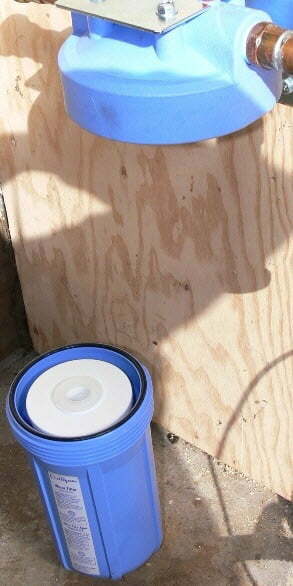 I would then add a whole house sediment filter by figuring out a to gain access to your main supply plumbing from your well. You could do this by diverting the supply plumbing in to a closet or accessible area in your cabin that would allow you to add a filter and service it. You should be able to tap into your system somewhere under the cabin adding a loop up through the floor into a close or similar. More information about your issues would be helpful. Feel free to upload an image or two if you have them. I’m doing some research into what goes into a well water installation so this site has helped me quite a bit. It’s helpful to know that a house water filter would be good to have to remove sediment and other contaminants that would taint well water. I’ll need to have this installed once I have a well water tank installed. hello, this may be a dumb question, but when you open the value to drain the water. when do you turn the valve back off? I’ve never change a filter before and everything I’ve read never mentions the valve again. Thanks for visiting our site and thanks for the question. I think you are asking about the valve in my system used to drain water out of the plumbing system prior to removing the filter for replacement. This step is not necessary, but because the filter housing in my system (and many others) is located lower in the plumbing system (similar to if your filter was in the basement), there will be trapped water in the pipes of the plumbing system that would need to drain out when you open the filter housing to replace the filter. This could amount to a large amount of water (several gallons or more), depending on your plumbing. To avoid this water spilling out when opening the filter housing for the filter replacement, I am simply emptying the plumbing in a controlled fashion via this drain valve. Once the water is drained, you may then close the drain valve at any time before or after opening the filter housing and replacing the filter. Just close the valve prior to re-pressurizing the system. You may not need to drain the system if there is a valve you could close that is located just after the filter unit. 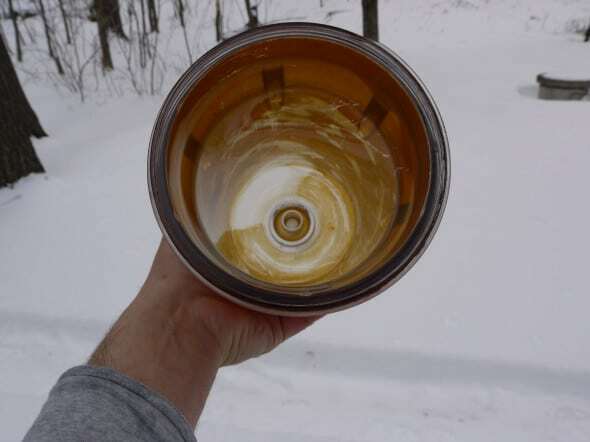 If you have a valve located there and close it, water in the system will not pass back through this closed valve and empty when you open the filter unit. Just remember to re-open the valve prior to using your system again. With my filter system there is also a small bleed valve located at the top of the filter unit. Press this valve momentarily after replacing the filter and closing the filter housing to bleed out air from the system. The air bleed is complete once water comes out of the valve. I am looking for advice. My cabin has a well with a drain back system. I want to install a Big Blue 5 micron whole house filter after the check valve and pressure switch but before the pressure tank. There is a snifter valve between the pressure switch and the pump. Goal is to keep the very fine sediment out of the pressure tank. Each time the pump starts it pushes air for about 20 seconds before water. Will the air mess up the functionality of the filter? I’m not very familiar with snifter valve systems. I assume you have a bladder-less water tank. From my limited understanding, I believe the snifter valve allows air movement back into your water tank to maintain the air “charge” and allow the proper function of a drain back valve. Placing a filter between the snifter valve and your well pump and drain back valve may very well cause problems, especially considering the two-way flow of water and/or air through the system. In addition, the filter represents resistance to flow and benefits from the pressurized water flow the pressure tank provides. 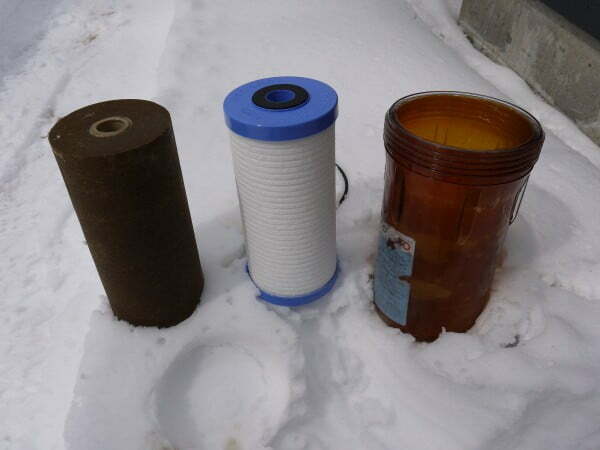 I would install the sediment filter after the pressure tank, not before it. Hi, Im very happy coming across this informati ve site, I have a drilled hole water from which the water is pumped to a resavouir tank positioned at an height, and then piped from the tank to the house. a filter is connected between the resavoiur tank and the house, I experienced low water preasure until I remove the fillter catridge, meaning the gravitational force is not enough to push the water across the filter catridge, how best is to solve this problem, there is no constant suply of eletricity. Thanks for the question. Although not familiar with your specific setup, and at risk of sounding overly simplistic; you could raise the height of your tank or change the filter system to a lower resistance system – either by trying a different filter element, cleaning the one you have (if possible) or switching to an entirely new type of filter canister and element.